The visual style is very effective and strangely affecting. I’ve been playing Papers, Please. It’s a very intriguing game. It makes you roleplay a border inspector who mostly worries about his own dreary life. By processing people, stamping them with an “approved” or “denied” stamp on their passport – or by detaining them if they’ve broken the law – you make money. You have to process about ten people per day or your family starts to suffer because you can’t afford rent, heat, food or medicine. Inspecting papers is a matter of spotting discrepancies in the documents. Just as you master the previous set and become quick enough doing it to feed your family without making mistakes (you’re fined for mistakes), the bureaucracy adds complications. You need to remember what citizen IDs, work permits, visit tickets and so forth look like, and how their official stamps should look like. Doing all that, you also need to cross-reference the passports numbers and names, where it’s not rare to find a single letter that’s a little bit off, or an expiry date long gone by. You’re so immersed in the details that sometimes the obvious pulls one over you; I’ve often forgotten to check gender, height and weight, not to mention the mugshot. The interface can drive you crazy, but that’s very much the point. You never have enough room to lay everything open conveniently, and that adds to your stress level. But you become better at it. If only it wasn’t for those damn foreigners from that one country that are always subject to “random searches”, which slow you down, you could be a great father. Or all the criminals trying to get in… You normally wouldn’t bother to detain them (as that takes more time and is more stressful to you), but you really need the kickbacks from the guards who are also paid by people processed. You flip between efficient bureaucrat, desperate father, hopeless citizen and a human being just trying to do his best in a bad situation. Maybe you think you can afford that one citation, because you really feel like this one guy should be let through despite his documents having expired yesterday. The people coming through your inspection post are not faceless. All of them tell some story, and even as you’re inspecting their papers you have to listen – for one part they may be criminals who might make mistakes in their story, and on the other hand your work is boring and it’s nice to feel like you’re dealing with people. Sometimes, when you’re denying every other applicant and detaining everyone you don’t let through, you pretend they’re not people. Papers, Please is a great example of telling a story through gameplay, setting, interface and your own feelings. The couple of shortly worded splash screens that set the scene are not cutscenes and you’re not bombarded with dialogue. This is one of the very few games in which you can’t skip the dialogue, because it’s so integral to what you’re doing – all the while telling the story. It isn’t a fun game, even though you are likely to laugh out loud at some of the characters and interactions. Mostly it feels stressful and somewaht disappointing. But at the same time you do get better at it and you do take pride in being a super efficient official and a dependable father, until something new comes along to spoil everything. Again. It is a very powerful emotional rollercoaster, all without voice acting or screens of text or outwardly emotional content. You are just inspecting papers. 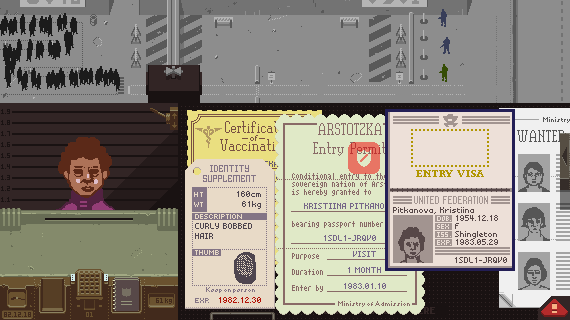 There are a lot of similarities to Cart Life, but Papers, Please is much more approachable and accessible. It doesn’t make you guess as much, and the whole is just more polished. Cart Life is wider in its handling of the human condition, but it asks a lot more of you to get to it. The creator also has some other intriguing games that I have yet to check out.